Exciting news! The Artemis BJJ women's class (which will be completely FREE) is starting this Sunday, on the 11th May. It will run from 11:00-12:00 at our Longwell Green location. For full details and directions to the gym, head over here. Hopefully I'll see you on the mats! I was covering tonight, as normally I'd teach on Tuesday, but Donal has a commitment every second Thursday of the month. It therefore makes sense to switch our days when that happens. Something I hadn't considered was that the Longwell Green location has lots of MMA people show up, because the gym we're based at has an MMA program (run by the gym owner, a friendly pro-MMA fighter). That means a lot of people do not have a gi. I therefore couldn't go with the collar-grip based class I was considering. However, that was ok, as I could simply switch to what I taught yesterday. I had to modify it a bit, given that the grips are rather different in no-gi. I am not entirely comfortable teaching no-gi, but was able to adapt the grips. Instead of talking as much about collar grips (though I did mention them, for the one person in a gi other than me), I discussed overhooks and underhooks. A handy grip to get is underhook then linking your hands over their back in a gable grip. That can enable you to progress into various attacks, such as the pressing armbar. 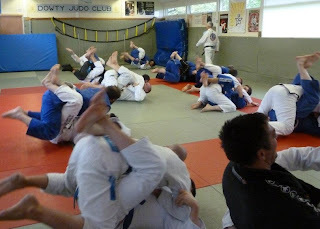 If they are wearing a gi, a basic but very useful grip is to get a really deep grasp of the collar: you may find it helps to sit up to get that in really deep. As Roy Dean discusses in Brown Belt Requirements, an especially deep grip can help your choke as well as give you authoritative control. Once you have it, that provides three main advantages. Firstly, this gives you great control, as you can pull them down towards you. Second, it could be the beginning of a choke, and perhaps more importantly, it will make them start to worry about that choke rather than thinking about passing. Teaching Notes: Given the lack of gis, I was essentially teaching a semi no-gi class tonight. I think focusing on the underhook grip could be a good option for when I teaching in Longwell Green, as that means I can have a progression there too. At Bristol Sports Centre, I can go with gi grips and my gi progression. In Longwell Green, I could move from the underhook grip into a pressing armbar. After all, that's what Nathan Leverton teaching in his basic nogi grappling system for closed guard, plus I learned another variation recently from Dave Jacobs (though that was butterfly guard). Jim, who is another MMA fighter, had a number of tips when he was drilling with some of the less experienced people at the gym. For example, when he does an overhook, he reaches through to grab their wrist (I think the opposite one?). Sam was commenting how much he liked that from an MMA perspective, as he still had a free hand to strike. It is basically the same as the overhook guard in gi, though without the choking options. Something for me to consider when I come to teach the overhook guard: I'll have a play at open mat some time.